Non-compliance (N/C) means that the athlete did not enter their Rating of Perceived Exertion (RPE) for that session. At the end of every workout, athletes are asked to enter their RPE into the coach's tablet on TritonWear Live. If they are unable to do so at this time, they will receive an email prompting them to enter their RPE for that session. Non-compliance occurs when an athlete does not input their RPE after receiving this email. Without the RPE, the load for that session will not be calculated and you will see N/C in the place of a load number. RPE is the intensity measure, which is required to accurately calculate load. If the athlete is consistently non-compliant, there will not be enough data to calculate their ACWR band (optimal training zone) and suggested training load. The Show Projections feature will also be disabled. Can athletes still enter their RPE if they don't do so after receiving the email? Yes, athletes can enter their RPE through TritonWear Insights. 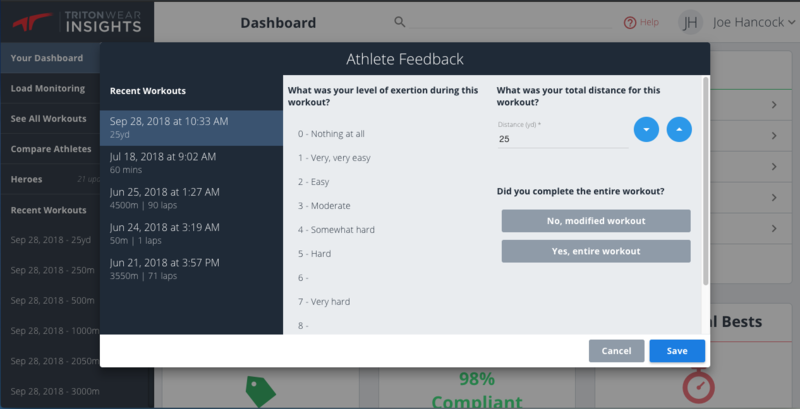 When an athlete logs into Insights, they will see a pop-up window with a record of the sessions missing their RPE. They can enter all of their missing RPEs then. Athletes can also go to the See All Workouts page > Select Workout > Click Add under RPE where available > Enter RPE > Click Save.